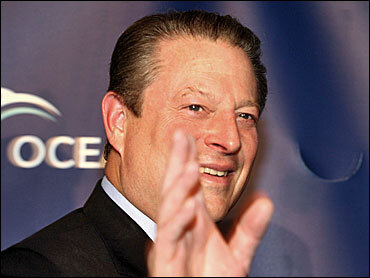 Could Nobel Prize Spur Gore To Run In '08? The Nobel Peace Prize, which will be announced Friday in Oslo, Norway, doesn't normally play a significant role in U.S. presidential politics. But the possibility that former Vice President Al Gore might take the prize has some Gore supporters buzzing that the 2000 Democratic Party nominee for president might be convinced to take the plunge once again. Gore and Canadian Inuit activist Sheila Watt-Cloutier, who were jointly nominated for the prize for their work on climate change, have been identified as likely winners by Nobel handicappers. If they win, Gore supporters say, it could spur the former vice president to make a late entry into the presidential race. "Winning a Nobel Peace Prize is a life changing event," said Dylan Malone, who runs a Web site called AlGore.org, which advocates a Gore presidential run. "If he wins (the Nobel), he will undoubtedly reassess the situation and think, 'Where do I go next?' He's done the slideshow, made the movie, won every accolade that our society has to give. There's nowhere else to go to take it to the next level in my mind." On Wednesday, the Web site Draft Gore paid for a full-page open letter to Gore in the New York Times. "You say you have fallen out of love with politics, and you have every reason to feel that way," reads the letter. "But we know you have not fallen out of love with your country. And your country needs you now -- as do your party and the planet you are fighting so hard to save." The ad said that 136,000 people have signed a petition asking Gore to run for president. According to Gore spokesperson Kalee Kreider, the former vice president "has no intention of running." "Vice President Gore truly appreciates the sentiment and the feeling behind the ad (yesterday), but as a private citizen his efforts are going behind a campaign of a different kind," said Kreider. "The vast majority of his energy right now is going into educating people about the climate crisis and trying to get that issue to a tipping point." That sentiment hasn't stopped Gore partisans. Peter Ryder, who is organizing a rally and concert in Iowa urging Gore to run, acknowledges that his efforts at times seem quixotic. Still, he says, "When I go around just talking to people, they all say, 'Oh my goodness, if Gore was running, there would be no question I'd support him.' If he got in, I think he would attract a great many Democrats." Even Gore's staunchest supporters admit that with the first presidential primaries likely to be held in less than three months, time is running out for a late entry to the race. "Because of his incredible appeal and his name recognition, he still has time, but the window of opportunity is closing pretty quickly," said Draft Gore founder Monica Friedlander. "The registration deadlines are closing for primaries. After the beginning of next month, it's going to be very difficult." Gore explicitly ruled out running in 2004, something he has not done this time around. But while the politician-turned-filmmaker has passionate supporters, most Democratic primary voters -- 67 percent in a CBS News poll taken in August -- said they are happy with the selection of candidates now in the race. If Gore does decide to enter, he faces an uphill battle: Hillary Rodham Clinton and Barack Obama alone have raised around $80 million each since the beginning of the year, and all of his potential rivals have been campaigning, advertising and debating for months. "There are genuine practical considerations at play here," said Democratic strategist and former Gore aide Chris Lehane. "One, the ability to get on a ballot in all these states with a small window of opportunity to accomplish that. Secondly, to put together a campaign and raise money in a very short time. Most of the activists and key players are already aligned with campaigns. These aren't impossible impediments, but they are significant." Democratic strategist and longtime Gore adviser Michael Feldman, who is not working on a presidential campaign, said he doesn't see Gore jumping in the race. "Everything he's said publicly and privately indicates that he's not planning a campaign," said Feldman. That's a sentiment echoed by Carter Eskew, chief strategist for the Gore 2000 presidential campaign. If Gore wins the Nobel Prize, Eskew said, "I think it will certainly increase efforts like you saw in the paper, but I really don't think it'll have any impact on him at all. I think he's on a different path right now." But Gore supporters are holding out hope. "A lot of people are sacrificing a lot," said Draft Gore founder Friedlander. "People are donating to this cause who can't afford to donate. But we believe very strongly he is very, very desperately needed. This is not a campaign of people who think he's a great guy. This is not about him. It's about the country."